– Why should anyone want to come and work here? – Why should anyone want to stay and work here? – How to raise motivation and dedication? While looking for these answers, make sure to involve your HR people, management, staff and consultants to get multiple points-of-view. The journey is divided into 7 steps. Think about what you are doing in each step and why. Educate the next generation today, to plant the idea of coming to work in your company in the future. If your business area has a drought of qualified candidates, or if what you do just isn’t popular anymore, then your employer brand has to reach further, to your staff’s children, students and schools. Raising awareness early is crucial and can be done by organising competitions, excursions or workshops. The impact of your business on the world is interesting, if presented well. Volunteer to lecture at schools and make yourself welcoming to interns and short term practice workers. Create a scholarship and give graduate students access to do research, that is valuable to both your business and their thesis. Consider alternatives. When vacant spots are filled automatically, but you have a feeling that filling the spot was unnecessary it may be time to reconsider the criteria for the position. New production methods may require new skills, if new staff is needed at all. Consider alternatives: redistributing the tasks, internal recruitment, manpower rental, helping hands (GoWorkaBit, TaskRabbit) or project based staff. Maybe the work can be redesigned to offer employment to older people or teenagers, people with disabilities or part-time staff or recent immigrants. Create the employee persona, so that you can communicate effectively with your target group. Describe values, goals, motivations and expectations of the job environment, selection criteria, hobbies and common media channels form the employees point-of-view. Personas can be created on Xtensio, McorpCX Persona and Hubspot, among others. The persona will help to define usable search methods, set the radius for communication, channels and how you should frame the announcement. Avoid listing requirements and expectations. Job ads that cut through the clutter are strategically designed and focus on describing what’s on offer. Potential recruits need to feel that a meaningful job and friendly environment are waiting for them. Hire for values. Train for skills. And give constant feedback. Your selection shouldn’t be based only on the quality of the CV and how the traditional interview went. Many companies today are hiring those that share the company’s values, but don’t have the necessary skill set. To find out if your potential recruit shares your values you can ask strategic questions during the interview as well as create assignments and tests, surprise situations or have the interview in unexpected locations. Recruitment software is also being updated to help recognise cultural fits (TeamScope, Visier). Involve other staff members in the process as well, to get their feedback as well as to speed up the on-boarding process. Define definite stages where the new recruit will get personal feedback. When saying no, its not enough just to inform. When you receive a CV, confirm that you got. When inviting for an interview double-check to make sure that the recruit understands the time and date as you do. During the process keep the candidate informed of the next steps. And even if you are forced to make a choice between several good candidates and say no to some, ask for permission to keep the CV and encourage them to apply again. Why? Because encouragement will reinforce their self-worth as well as your brand. Use the new recruit’s arrival period (one month to several months) as part of the on-boarding process. The candidate accepted your offer, but until they arrive usually there is only silence. Use this time to communicate easy-to-digest information about the company: mission, vision and values, colleagues and traditions as well as the plan for the first week. A person about to change a significant aspect of their lives is motivated, receptive to information and looking for confirmation, that the decision they made was the right one, and that they are expected. The on-boarding program requires defined activities, a time plan, responsible individuals, regular feedback and criteria for judging progress. Use the buddy system to reduce administrative burden, by having old hands take one or two new recruits under their wing to explain both the written and unwritten rules. 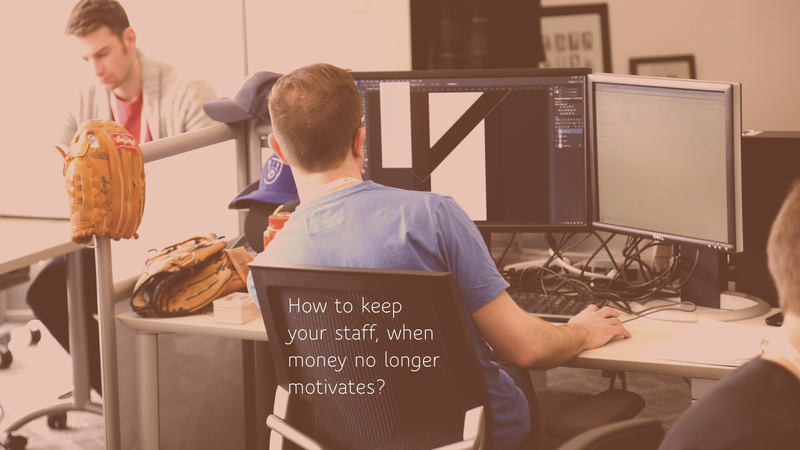 Create an understandable recognition policy, that benefits both staff and the company. It’s fun to select the employee of the month, but recognition can also be taken to the next level. Ensure that recognition is based on KPIs that are tied to the goals and values of the company. Find out if staff feels that they can influence the company’s success, what form of recognition they actually care about as well as how often they expect to be commended. When the KPIs are in place ensure that everyone understands the criteria for recognition, who decides and where to track progress. In internal communication don’t forget to pay as much attention to the form of communication and the channels, as the content. If your staff isn’t up to reading about everything, then make a film instead and deliver the message in the channels where it will actually be seen in. Say goodbye in a manner, that leaves the door open for best of them to return and the worst of them, not to ruin your brand with a tantrum. If you need to fire someone, make sure that both the person and all affected colleagues understand which values were erred against. This way you both reinforce the values of the company as well as their importance to the brand. Create an off-boarding format that allows the person in question to vent, providing you the opportunity to reduce tensions. This may help avoid them venting on social media, where a company’s response is often constrained. To those wishing to leave to try other challenges, make explicitly sure that they understand, that the door is open for them to return, and ask to keep their contact information on file. People today move around, from job to job. No reason they may not come back smarter and more motivated after a few years elsewhere. A detailed mapping of the employee journey creates a long to do list for every stage of the process, providing opportunities as well as illustrating shortcomings that must be fixed. The journey map provides examples and inspiration, that helps to focus the recruitment process as well as places to look for solutions. All of the seven stages of the recruitment process and employee journey, once mapped, also provide answers to the questions of why one should apply, why they should stay as well as how to keep everyone motivated. The employer brand and the company brand are one and the same thing, which is why the business KPIs and motivational KPIs achieve the same goals: reduced churn leads to improved performance, savings on cost as well as greater customer satisfaction and loyalty.